From spring through late summer, it’s an evening ritual. I grab my faded colander from the kitchen cabinet and a pair of shears kept near the back door, while dinner grills or simmers on the stove. The kids tumble down the deck and across the grass to the garden where we fill the dish with sweet cherry tomatoes, crisp romaine, and plump spinach. 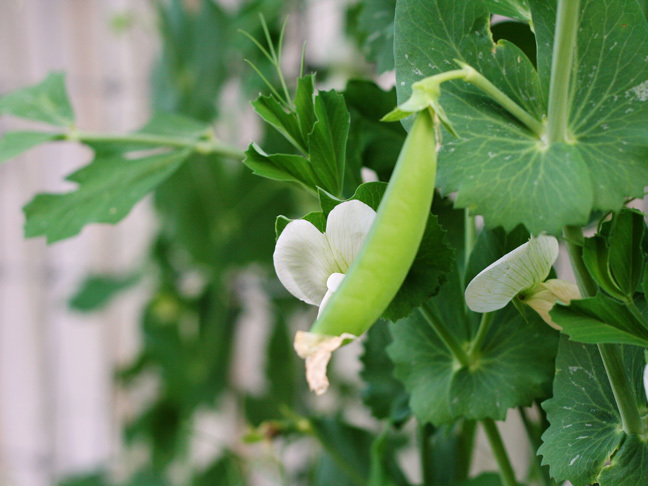 Depending on how early in the year it is, peas and arugula follow the other vegetables. We spend a few moments considering the green tops of carrots and radishes, trying to decide which to pick. They come up from the ground with clumps of earth clinging to their colorful flesh. I walk inside to wash and chop while the kids climb the apple tree. Our summer salads are as much a part of the season as popsicle-stained lips and the smell of sunblock and chlorine. Whether planted in half wine barrels, plastic pots, or garden beds, I’ve had a salad garden in each of my homes for the past ten years. 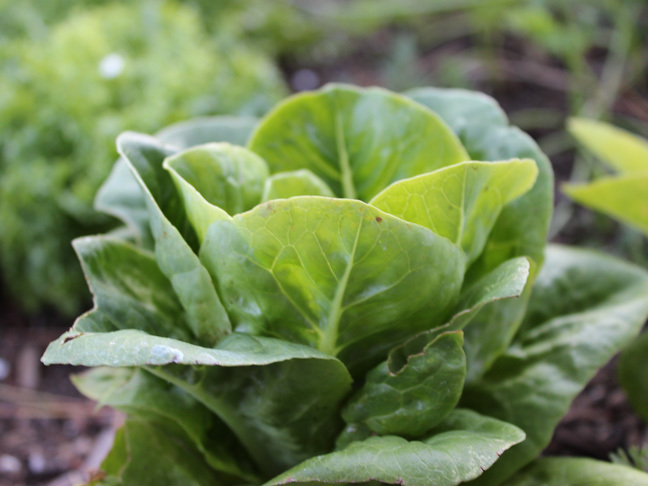 Here is how to make a salad garden in your yard or on your deck in four simple steps. 1. Bigger isn’t always better. The best salad garden I’ve planted was contained in a pair of wine barrels on the edge of the sidewalk in front of my house. With plenty of sun—and a great drip-line system—I was able to utilize an area of my front yard previously occupied by bark chips and rocks. When trying to decide where to put your garden, think outside the backyard and maybe consider planting in some great containers. 2. Bigger isn’t bad either. My current salad garden is in a four foot raised bed. With plenty of room to cycle your greens, a larger bed can also provide areas to experiment. I am currently experimenting with microgreens and miniature romaine in a cozy little corner of my bed, while the majority of the space is being utilized by the more “mundane” salad ingredients. 3. Get colorful—and not just with your containers. Too often, people associate vegetable gardens with a wall of green. 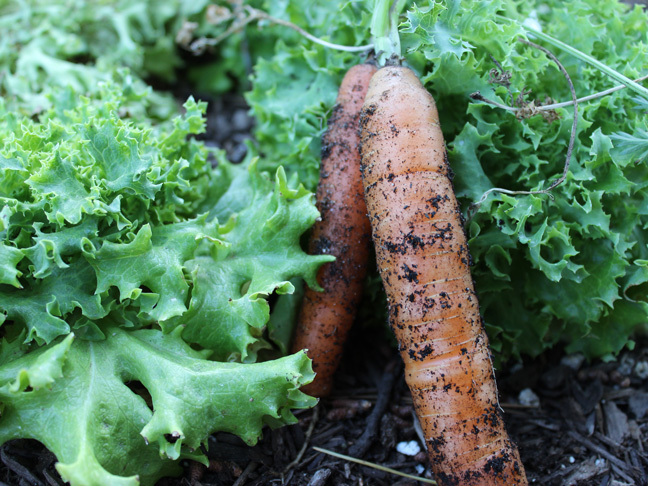 With online seed companies and seed sharing communities, we have an amazing opportunity to experiment with color and texture in our salad gardens. My children and I are in the process of planting a fairy farm of dwarf bok choy, gem lettuces, and baby carrots—all of which we’re excited to taste and watch grow. Don’t forget edible flowers! Spicy nasturtium and sweet violets can add color and flavor to your salad and your garden. 4. Get your children involved. Gardening is one of our favorite family activities. While they complain about the more “boring” chores—weeding and thinning—my kids get as excited as I do when the seed catalogs arrive. They plant the seeds, water the sprouts, harvest the vegetables, and eat their bounty. In summer, they can be found sitting in front of their salad bar, nibbling at lettuce and tomatoes between dips in the pool and dashes through the sprinkler. Handing them a plate and telling them to go pick their dinner has done more for getting them to eat their vegetables than all the bribes in the world. Have you started a salad garden?